Jessica Malik, BlackBerry’s Senior Product Marketing Manager, took to the Inside BlackBerry Business Blog this morning to announce the availability of BBM Protected or Android and iOS. Announced last year, BBM Protected is a secure messaging solution for enterprise customers for trusted instant messaging. 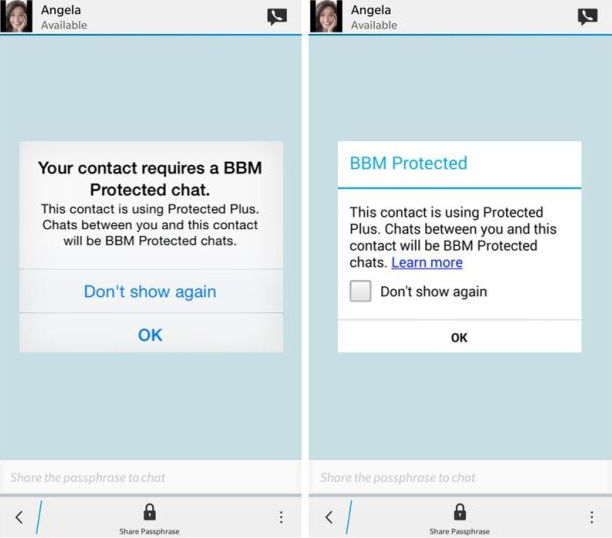 This week’s announcement means staff at companies that use BBM Protected can now chat with people or customers at non-BBM Protected companies, even if they’re on iOS or Android, provided they have the regular version of BBM installed. The non-BBM Protected user will just see a pop-up notifying them that the sender is using BBM Protected and that the conversation will be safeguarded. “Now is the time for IT admins to take back control of their mobile and instant messaging to secure how all data is exchanged both inside the enterprise and, more importantly, with their customers and partners,” Malik wrote, revealing that the average cost of a data breach for companies in the United States is $6 million. Every message sent using BBM Protected is encrypted using keys generated by the communicating devices, which BlackBerry claims prevents “man in the middle” hacker attempts, and the service itself is FIPS 140-2 validated by the U.S.’s Department of Defense.